Energy storage centre "Regucor WH"
OVENTROP-Energy storage centre "Regucor WH"
Modular system for the supply of detached and semi-detached houses with heat and hot water. Storage cylinder and add-on groups coordinated functionally and thermodynamically. With integrated piping and plug-in cabling. By subsequent installation of the solar station "Regusol L-130" (item no. 1383480) and the electronic controller "Regtronic RS" (item no. 1383485), the station can be upgraded to a "Regucor WHS". For combination with classic (e.g. gas/oil) and regenerative heat generators (e.g. 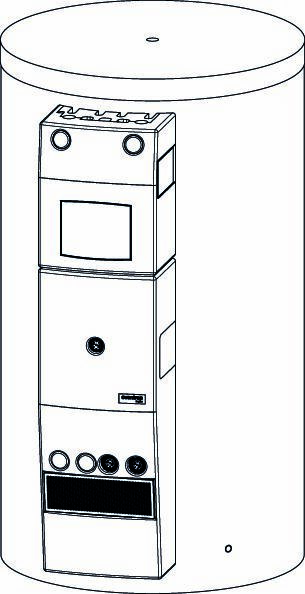 heat pump/ solid fuel) in existing and new buildings. 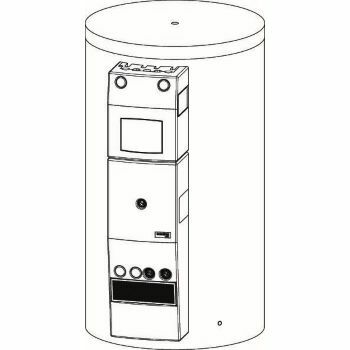 Solar buffer storage cylinder: System storage cylinder type 1000, nominal content 900 litres Total height (without insulation): 2055 mm Diameter (without insulation): 790 mm Max. pivot height (without insulation): 2100 mm Connections: 8 x G 1½ female thread Max. operating pressure ps: 3 bar (coil 10 bar) Operating temperature ts: 95 °C (coil 110 °C) With removable 140 mm fleece insulation and integrated temperature layer unit. Connections and fixing positions coordinated with "Regucor WHS" storage cylinder add-on groups. Add-on group fresh water: "Regumaq XH" DN 20 Hydraulically controlled heat exchanger system for the hygienic heating of potable water on the flow principle. Recommended discharge capacity: 15-20 l/min., depending on the set potable water temperature and the existing buffer water temperature. Connections G ¾ male thread flat sealing, with high-efficiency pump Wilo-Yonos PARA RS 15-7 PWM2, temperature controller 40 °C - 70 °C, copper brazed stainless steel heat exchanger. Connection set for energy storage centre "Regucor "WH/WHS"
Extension connection set for energy storage centre "Regucor WH/WHS"